Now it’s the trawlermen who work off Rhode Island who’ve told a wind developer to stick its wind turbines where the sun don’t shine. 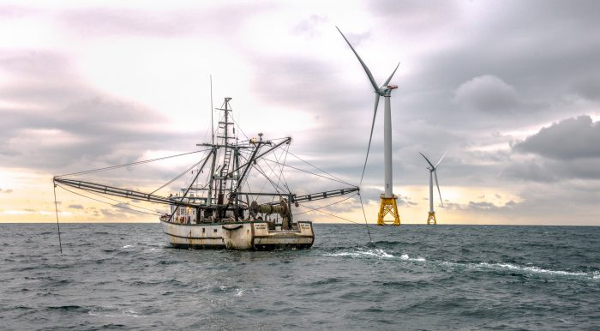 Fishermen across the Ocean State are worried a proposed offshore wind farm in the Rhode Island Sound would harm the state’s fishing industry. The Coastal Resources Management Council will vote on Jan. 22 whether to approve Vineyard Wind’s proposal to install 84 wind turbines off of Martha’s Vineyard to supply power to Massachusetts. “This is a losing proposition for the fishing industry- big time,” said Lanny Dellinger, who is the chair of the state’s fisheries advisory board. One of the chief concerns Dellinger has about Vineyard Wind’s $2 billion proposal is the way the company wants to arrange its turbines. Under a northwest to southeast layout, Dellinger said fishermen could snag their nets on traps and even crash into a turbine. “I guarantee you we’re going to lose fishermen out there,” Dellinger said. Meghan Lapp represents a fish-processing facility that operates trawlers. She told NBC 10 News fishermen will suffer no matter how the turbines are laid out. “Our vessels are not going to be able to operate in that area regardless. One nautical mile spacing is not enough for our vessels to operate and many of customers to operate, as well, so that area is gonna be a complete and total loss to us,” said Lapp, fisheries liaison for Seafreeze Limited. A draft environmental impact statement released last month found the wind farm could have a moderate to major long-term impact on certain aspects of the commercial fishing industry, but Vineyard Wind claims only a small percentage of commercial fishing is done in the proposed wind farm area. Even though the project is in federal waters, regulators in Rhode Island have jurisdiction since it would affect fishing in the state. “I truly feel that it could be the end of Rhode Island’s seafood industry,” Dellinger said.